Hi Hayley, We came back from our USA trip last Thursday but got very hectic upon my return catching up with everything happened in my absence. Adventure awaits you in the hidden gem that is the state of Utah. Most USA visitors never make it as far as Utah, but its attractions are truly not to be missed. White-water rafting down Cataract Canyon or the tranquility of Lake Powell will satisfy the water enthusiast and Salt Lake City is not only beautiful, but full of history and interest. Bon Voyage has been planning and arranging holidays to Utah for 30 years. Allow Bon Voyage to tailor make a Utah holiday adventure with the quality and service you deserve. Call us today! On this colourful tour of Utah you'll explore the National Parks of Zion, Bryce, Capitol Reef, Canyonlands and Arches. 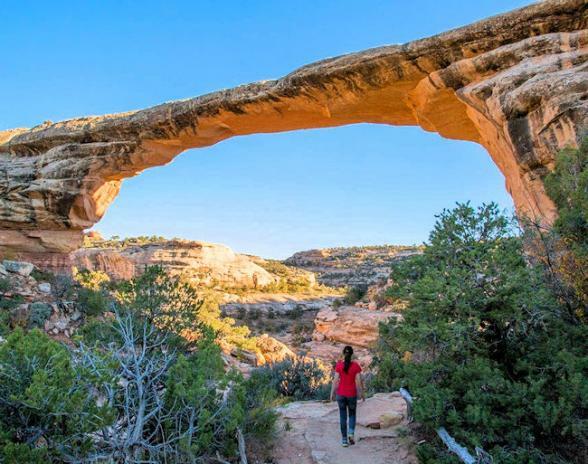 This is a contrasting journey of discovery from the mighty, majestic mountains of lush Colorado to the red sandstone canyons and incredible National Parks of stunning Utah. This is an incredible journey through some of America's Great National Parks including Yellowstone, Grand Tetons and Monument Valley. An incredible journey that showcases the wonders - both natural and man-made - of this wonderful area of the Western United States. This adventure takes you through Big Sky Country where the spaces are vast, the mountains are rugged and the views are incredible. Discover three of America's best national parks and visit Bryce Canyon, Zion and the Grand Canyon on this escorted tour of the Canyonlands. National parks, national monuments, scenic drives and natural wonders. This western adventure takes you through the very best of America's Western states. Explore the very best of America's scenery with this Spirit of the Desert, national parks tour around the south west. Discover the rich and diverse cultures of America's southwest - the unique mix of Native American traditions, the spirit of the Old West and Hispanic and Spanish influences. This is perfect for lovers of spectacular scenery, flaming sunsets and jaw-dropping national parks. This fly-drive adventure takes you through the magnificent Grand Canyon State and beyond. Start in exciting Las Vegas, then spend the next week riding through Nevada, Arizona and Utah. On this exciting guided holiday through Montana, Utah, Arizona, Colorado, Wyoming, South Dakota and Nevada you'll enjoy some of America's most amazing scenery and breathtaking national parks. On this 14 night pre-planned motorhome adventure, soak up Arizona and Utah's awe-inspiring scenery - from the mighty Grand Canyon to the dramatic scenery of Canyonlands. On this 18 night pre-planned motorhome adventure of Colorado, Utah, Arizona you'll discover some of America's most awe-inspiring scenery. 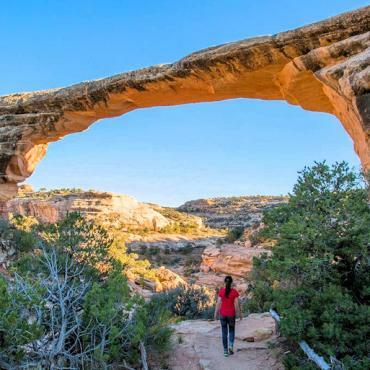 Taking you inside America's impressive canyon country, explore the incredible natural structures of Arches and Canyonlands National Parks, Mesa Verde and the Grand Canyon. Blazing a trail around the natural wonders of the west, you'll see canyons, monuments and monoliths from Monument Valley to the Grand Canyon, Bryce and Zion National Parks. Heading down through the Old West, this family holiday reveals the excitement of the land of cowboys, Native Americans and the awe-inspiring Grand Canyon. Living the cowboy lifestyle, you cross four national parks, including Grand Teton, on your way to visit charming all-American towns, see iconic landmarks and hear tales from the locals. Stetsons, saddles and spectacular Mount Rushmore - this Wild West family adventure, perfect for all the family, takes in the frontier town of Jackson, the Grand Tetons and Yellowstone National Park. This trip blends old west towns like Jackson, Cody, Sheridan and Montpelier, national parks like Yellowstone and Grand Teton, and historic monuments like Devil's Tower and Mount Rushmore. One of the most incredible bodies of water in the USA straddling the Arizona/Utah border. Calling all stargazers - World's First International Dark Sky Park! Travel from the Mojave Desert, through the stunning Virgin River Gorge along the Arizona Strip, and into the dramatic Colorado Plateau's stunning red rock formations at Zion. A trip to Utah's Bryce Canyon National Park offers an incredible 7000 ft gain in elevation from Las Vegas to the towering pines and dramatic overlooks of Bryce. Monument Valley is located along the Utah/Arizona border towards the southeast corner of Utah. Whether or not you are aware of it, you have very likely already seen. The ever-popular Ruby’s boasts the closest accommodation to Bryce Canyon National Park. Nestled in the heart of Zion Canyon along the Virgin River, The Cliffrose is truly an oasis of peace, serenity and relaxation. The name "Zion" means a place of peace and refuge. Located at the west entrance to historic Bluff, the Desert Rose Inn is a charming all wood style building with massive timbers. Situated less than two miles from the park entrance, Driftwood Lodge is surrounded by Zion's majestic red cliffs and spires. Bryce Canyon Lodge offers a rustic 1920s elegance - down to replicas of the lodge's original hickory furniture - this beautiful "in-the-park" lodge is on the National Historic Register. Located in the heart of downtown adjacent to the Salt Palace Convention Centre and two blocks from Temple Square. A unique location at Wahweap Marina overlooking spectacular lake panoramas. SkyRidge Inn is a delightful alternative to motel lodging near Capitol Reef National Park. Sitting along a bend in the Colorado River known as 'white rapids', Red Cliffs Lodge rustic setting is the prime destination for relaxation and adventure. Situated steps from the entrance to Zion National Park, Cable Mountain Lodge is a great place to stay, leave your car at the hotel and go off to explore this incredible park. Located in “he Heart of The Trees” in Torrey, Utah and just minutes from the entrance to Capitol Reef National Park. The Majestic View Lodge is situated at the base of towering cliffs near the entrance to Zion Canyon in the southern Utah town of Springdale.. The Best Western Bryce Canyon Grand Hotel offers some of the newest accommodations for visitors to Bryce Canyon National Park, Utah.